The Belt and Road Initiative (BRI) upholds the concepts of peace, win-win cooperation, and development, and is guided by an openness to actively promote economic globalization and trade liberalization to facilitate common development with countries along the routes. 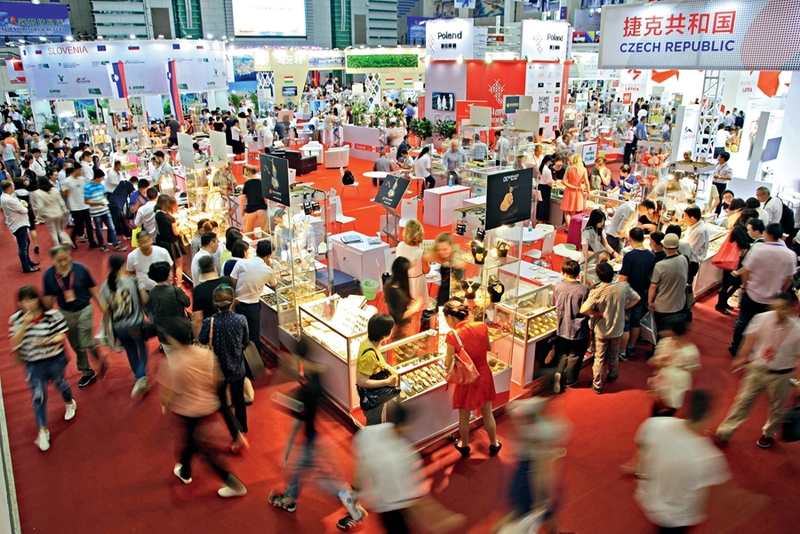 Featured commodities from Central and Eastern Europe are displayed at Ningbo International Convention and Exhibition Center in Zhejiang Province on June 9, 2017. Since Chinese President Xi Jinping proposed the “Silk Road Economic Belt” and “21st Century Maritime Silk Road” in the fall of 2013, European countries have responded positively and participated extensively. In October 2015, 14 member states of the European Union (EU) became the founding members of the Asian Infrastructure Investment Bank, a landmark event of cooperation between China and the EU over the BRI. In the same year, at the 17th China-EU Summit and the fourth Summit of China and Central and Eastern European Countries, state leaders completed the top-level design of the Sino-European cooperation on the BRI at three levels. First, at the strategic level, the connection between BRI and European development strategy; second, at the industrial level, connecting China’s international cooperation on production capacity with European investment plan; third, at the regional level, integrating the cooperation between China and Central and Eastern Europe with the overall cooperation between China and Europe. In the past five years, driven by the BRI, China’s trade with the EU has risen immensely, with bilateral trade in goods hitting new highs and service trade showing rapid growth. This more balanced development is mainly reflected in the following aspects: First, in the past five years, China’s imports from the EU have grown faster than its exports to the EU, and China’s trade surplus with the EU has narrowed significantly. From 2013 to 2017, China’s imports from the EU grew at an average annual rate of 3.4 percent. During the same period, China’s exports to the EU grew by an average annual rate of 2.3 percent. 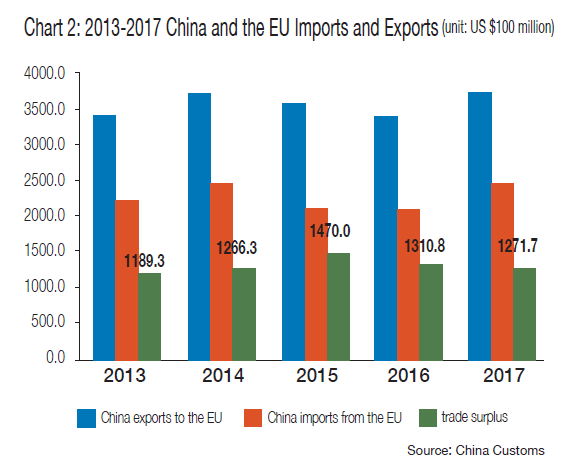 As China’s imports from the EU grew faster and the imbalance in bilateral trade improved, the proportion of China’s trade surplus in total bilateral trade volume narrowed from 26 percent in 2015 to 20.6 percent in 2017 (see chart 2). 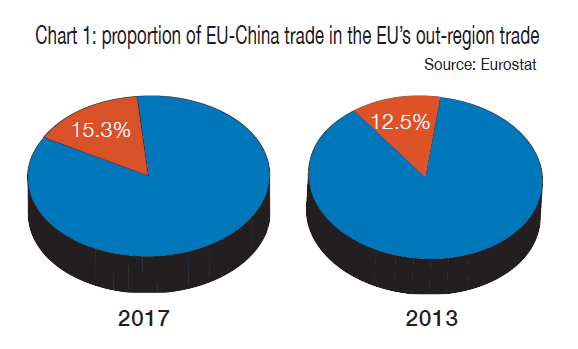 Second, the share of China’s trade with the 13 countries that joined the EU after 2004 has increased in China-EU trade. The Sino-EU trade in the past mainly relied on Western Europe. During the past five years, with the advancement of the BRI cooperation between China and the Central and Eastern European countries, this situation is changing. In 2017, China’s total trade volume with the 13 countries, including Poland, Hungary, Czech Republic, Slovakia, and Croatia, totaled US $69.16 billion, accounting for 11.2 percent of China-EU trade, an increase of one percentage point from 2013. Third, China has increasingly diversified its products imported from the EU. The proportion of China’s top 10 imported products from the EU dropped to 74.3 percent, a decrease of about three percentage points from 2013; meanwhile, the imports of consumer products increased rapidly, and the average annual growth rates of cereals, dairy products, jewelry, and artwork all exceeded 30 percent. China is the EU’s third largest services trading partner. According to the OECD (Organization for Economic Cooperation and Development) database, in 2016, the China-EU service trade volume reached US $75.09 billion, an increase of 29.7 percent from 2012. Among them, China’s service exports to the EU amounted to US $32.69 billion, and its service imports from EU amounted to US $42.4 billion. The average annual growth rates of China’s exports and imports of EU services from 2012 to 2016 was 6.6 percent and 6.9 percent respectively, higher than the increases in imports and exports of goods between China and the EU during the same period. The EU’s service trade with China is in surplus. Currently, China’s service exports to the EU and its service imports from the EU account for 3.9 percent and 4.5 percent of the EU’s out-region service imports and exports respectively. While, as the EU’s largest service trading partner, the U.S.’s imports and exports of services with the EU accounted for 30.2 percent and 27.2 percent respectively of the EU total. 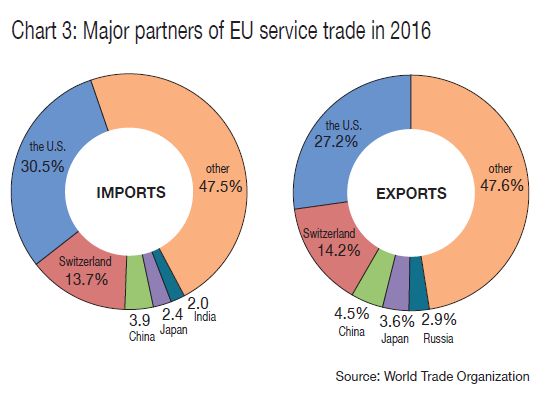 The figures for Switzerland, EU’s second largest service trade partner, are 13.7 percent and 14.2 percent respectively (see chart 3). Compared with these two countries, China has great potential for service trade with the EU. 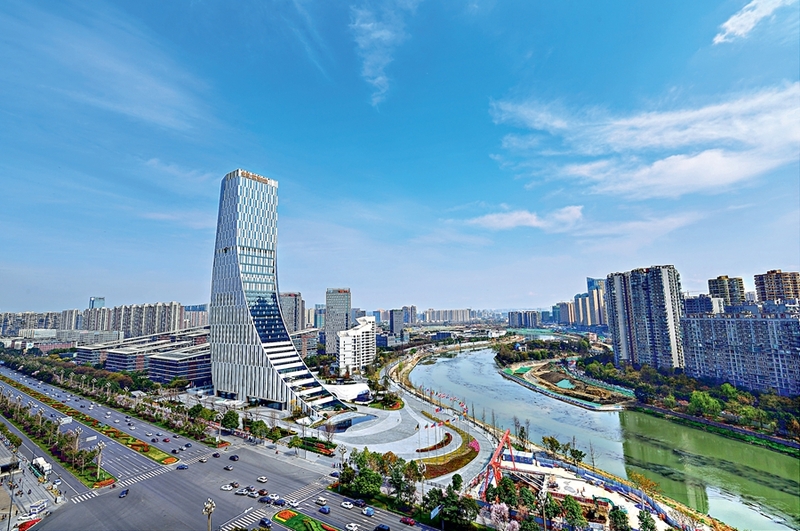 The Business & Innovation Center for China-Europe Cooperation (CCEC) in Chengdu, capital of Southwest China’s Sichuan Province, serves as a platform for the western part of China to cooperate with Europe in trade, investment and technology. The year 2018 marks the 15th anniversary of the establishment of a comprehensive strategic partnership between China and the EU. It is also the 20th anniversary of the establishment of the China-EU Summit. China and the EU share common interests in economic globalization, trade liberalization and the multilateral trading system. As two world’s leading economies, China and EU are working hand in hand to build the Belt and Road, which will help both parties further develop their respective advantages and achieve common development. In April 2018, Chinese President Xi Jinping announced at the annual meeting of the Boao Forum for Asia the major steps China will take to further expand its opening-up, including significantly easing market access, creating a more attractive investment environment, strengthening protection of intellectual property rights, and actively expanding imports. In particular, the first China International Import Expo will be held in Shanghai in November 2018, which will provide a new and larger platform for EU countries to expand their exports to China, thus making China-EU trade further progress towards balanced development. Yao Ling is a senior research fellow with the Chinese Academy of International Trade and Economic Cooperation of the Ministry of Commerce.